The Black stork (Ciconia nigra Linnaeus, 1758), as well says the common name and also the scientific one, is the “dark version” of the traditional and much more known White stork (Ciconia ciconia). This large bird belongs to the order of the Ciconiiformes and to the family of the Ciconiidae and is, with the white one, one of the only two species of stork present in Europe. Whilst the white stork has been involved in the popular tradition in anecdotes, little stories and legends, the black results almost unknown to many as, not bearing in any way the proximity of the human being, has chosen a modality of life rather solitary and away from any human activity. Nice was the definition given by a child about the traditional saying that indicates the white stork as the one delivering the newborns to the families. 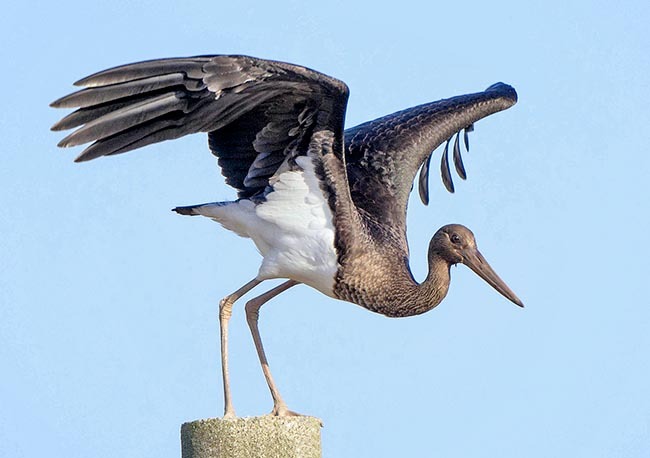 To a question of what it might do the black stork differing from the white, he replied angelically and nicely that whilst the white carries the white children, probably the black carries the black ones. Very few know it and equally few are those who have had the possibility to see it in the wild. Not always the stops this stork makes during the very long migratory trip towards Africa, coincide with place frequented by the common people. 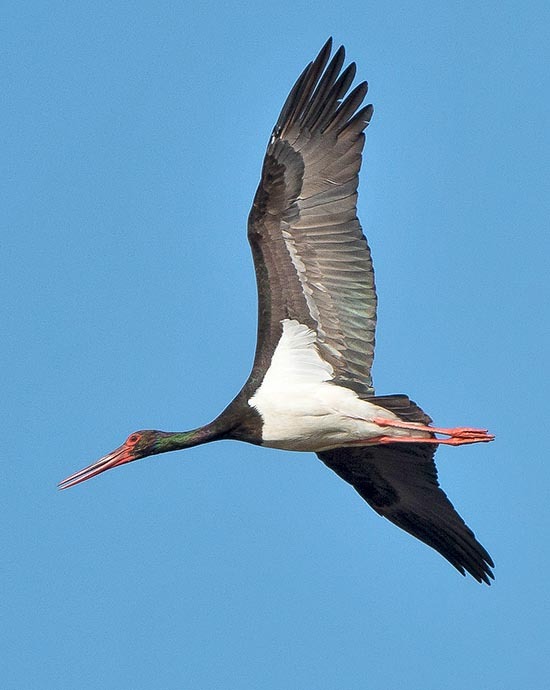 The black stork is reserved also when passes in our skies and rarely is sighted on the ground seen that it loves to stop in isolated sites, far from any inhabited centre and, unlike the white that chooses open spaces, stays embedded in channels, in humid uncultivated meadows, full of brushwood and in alluvial levees. Only when it stops in rice fields, in oxbows and open spaces it can be observed more clearly but always from far away seen its atavistic shyness and the prompt reaction to the escape and also in this case the inexperienced classifies it from time to time as a grey heron, as a white stork or as an unlikely crane. By sure, the scientific name does not need deep etymological explanations. Ciconia from the homonymous Latin term that rightly identifies the stork and nigra from “niger” = black. The various vulgar names just follow the same meaning. In English Black stork; in Italian Cicogna nera; in German Schwarzstorch; in French Cigogne noire; in Spanish Cigüeña Negra; in Portuguese Cegonha-preta. Last anecdote, but without any morphological or characterial reference, the name black stork has been used in jargon by the American special forces operating in Pakistan. A docile and reserved bird unknowingly involved in quite different activities. The European range of this stork is almost exclusively central-eastern being totally absent in southern France, in Italy, in Greece and in most of the Iberian Peninsula. In southern Spain and in Portugal is present an isolated population. However, it stretches northwards covering the French coasts of the North Sea, of the Baltic, continental Russia and, through the cool temperate belt of Asia, to reach the Pacific Ocean coasts. Is absent in Denmark, in England and in the whole Scandinavian Peninsula. Is present also in a ring-wise belt crossing Kazakhstan, Kyrgyzstan, Afghanistan and the north of Iran, getting to touch the southern coasts of the Caspian Sea. An isolated and sedentary population lives in Austral Africa. The black stork is a strongly migratory species with two different hibernation areas. The European population hibernates in Africa, in a narrow sub-Saharan belt that from Senegal reaches Ethiopia and southwards up to Tanzania. Conversely, the Asian population hibernates in the Indo-Malay subtropical belt but does not reach Indonesia and the extreme parts of the Indian and Indochinese peninsulas. As usual for gliding birds, the black stork performs its migrations taking advantage of the thermals that, as known, form only on the mainland and consequently when it crosses ample stretches of sea it tries to cross them in the narrowest points. As a matter of fact the two preferred European routes are the Strait of Gibraltar, for the populations of the western countries, and the Bosporus strait for the eastern ones. Also Italy and Greece are partially involved by the migration of a rather limited number of specimens that cross vertically the two countries for reaching the African winter quarters. There is a clear separation between the European populations and the relevant African hibernating sites. An imaginary frontier starting from the mouth of the Elbe River in Germany up to Belgrade in Serbia, marks the apparent boundary dividing into two the migrations of this bird. The populations west to this line migrate along the Iberian Peninsula, the east ones through the Bosporus. Also the Italian one will proceed towards the Africa western quarters whilst the Greek one will go in Sudan and in the Rift Valley. More than any other migrant, this bird has a very narrow and well defined migration front and rarely exceptions occur to these tracks. Furthermore, often they migrate in very reduced groups and it is not rare to see them performing the crossings singularly. Also in the hibernation places it keeps this behavior and remains often isolated or united to very reduced groups of specimens. 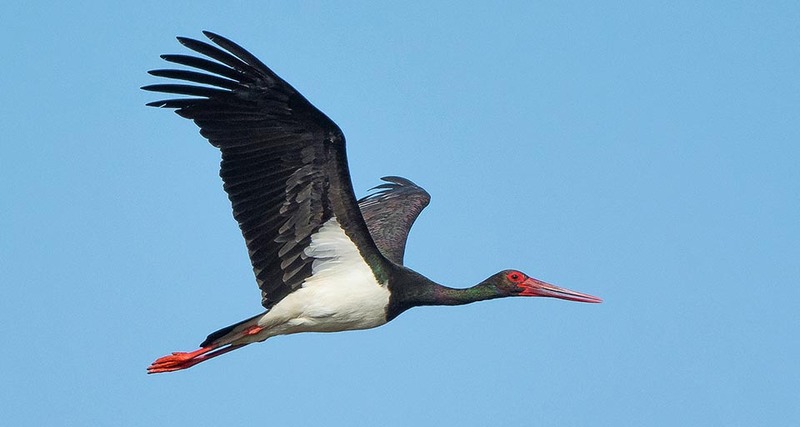 The black stork is an aquatic species, much more linked to the water than the white one, therefore it loves to live and nidify in humid woods and areas close to water streams and swamps and may reach the 2500 m of altitude if it finds suitable habitats. The places frequented during the two phases of its migrant life are often quite different each other. During the migration the chosen environment is much varied and does not follow the one usually lived during the nidification and the hibernation. Often it exploits occasional sites as not always is possible to make appropriate choices. In Africa, on the contrary, it often contents of dry and predesert savannahs but always close to swampy locations and water streams. The arrival in the summer quarters coincides with our spring. Already by the end of March the first arrivals take place and by the end of August and along the whole month of September the autumn migration begins again. Being an aquatic species, the preferred food of the black stork is of course linked to this habitat. It nourishes almost exclusively of fishes but also of frogs and various amphibians, grass snakes and small mammals, insects, snails and small birds. Usually it hunts staying in the water to its knees, waiting for the least movement of the prey to hit with its big and powerful beak. By sure, the black stork does not go unnoticed seen its remarkable dimensions. With a 2 m wingspan, a length of almost 1 m and a weight of almost 3 kg, it is only slightly smaller than its congener, the white stork. The livery is completely black with evident greenish violet reflections, but the belly that is candid white. The beak and the paws are scarlet red well visible even from far away. Also the eyes are outlined by spectacles of the same colour. There is no evident sexual dimorphism but only a slight difference in the dimensions, in favor to the male. The young have a much less evident livery and the black colour is very dull and amber without any metallic reflection. The red parts of the adults are on the contrary replaced by olive grey. 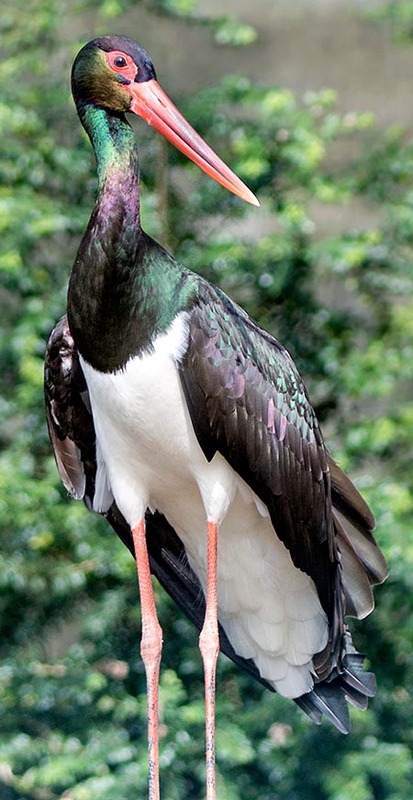 The livery of the black stork is very similar to that of the Abdim’s stork (Ciconia abdimii) African species with whom it shares the territory during the hibernation period. Only difference is the absence of the red colour and the white-black underwing in the Abdim, that is, on the contrary, totally black in our stork. The Ciconia nigra is more vocal than the white and often emits contact guttural sounds and, when on the nest, some acute squeaks of recognition besides beating noisily the beak in presence of the partner. 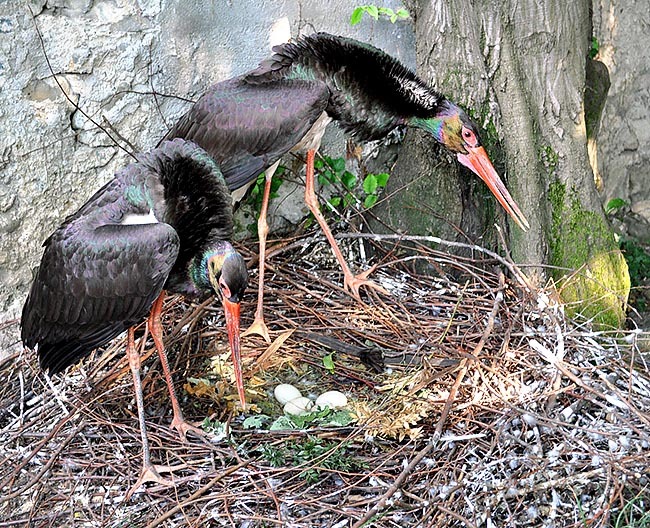 The black stork is a solitary nidifier that places the nest on the top of very big trees hidden in remote wooded areas. All characteristics evidencing its reserved and absolutely unable to accept the human presence character. In some areas and when available, it builds the nest on rocky and inaccessible cliffs. It builds the nest, that may exceed the 150 cm of diameter, with dry branches of remarkable diameter, covering it inside with softer material and anchoring it firmly on the branches in order to render it able to bear the weight of the numerous brood and of the parents too. It often uses the same nest for several years. 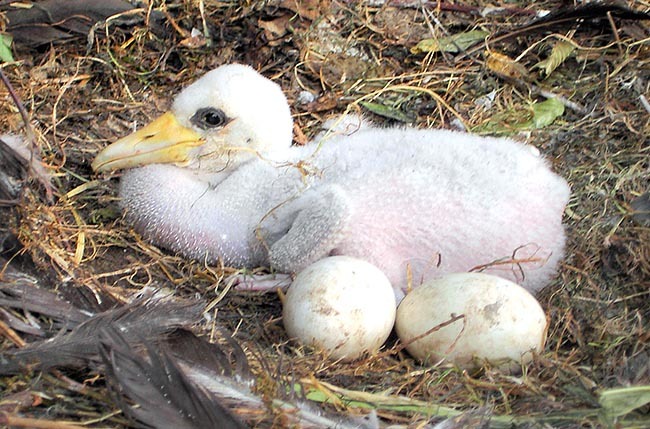 It lays three to six very white eggs that are hatched by the only female for about 35 days and the chicks keep in the nest for 10 weeks more before flying off. For some more weeks they will still depend on the parents and will reach the full maturity after the third year of age. It is to be said that when at times the food is scarce, the parents kill purposedly the weakest specimens of the brood in order to give a better possibility of survival to the other ones. The pullets are not aggressive among them, but a first natural selection takes place during the grabbing of the food taken to the nest by the parents, where the weakest chicks are often unable to get to it. This species is not subject to strong extinction risks even if their number is in some areas in decrease due to the loss of their natural habitats. In the wild, their longevity reaches the 18 years, whilst the same in captivity may exceed the thirty.